Wash strawberries. Cut off the stems and then cut a hat off the top. 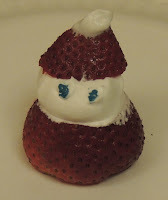 Add whip cream for a beard and more for a hat. Add sprinkles for eyes. Appropriate for 1’s and up. Nutrition, Logic, Small Motor, and Sensory.